Life is made up of small pleasures, and on the top of my list is the smell of a beautifully scented soap, followed closely by freshly washed laundry. 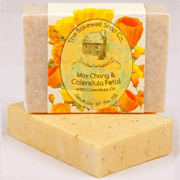 Despite hand-washing soaps and shower gels I always like to have a bar of soap in my bathroom, and my latest addition is the May Chang & Calendula Petal soap from The Bakewell Soap Co. With sharp lemon notes and hints of orange this buttery-orange soap – speckled with healing Calendula petals – is perfect to wash my face and hands. I particularly like its lovely strong scent as it makes you feel invigorated. And May Chang oil is naturally antiseptic and has some anti-inflammatory properties, so not only does is smell delicious it’s also a great deep cleanser. 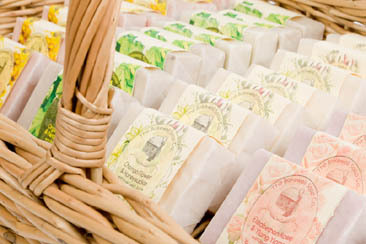 The Bakewell Soap Co are based in the famous English town of Bakewell, located int he heart of the Peak District. Their products are bursting with skincare benefits, they improve skin elasticity, they’re moisturising and repair cells, they are anti-inflammatory, naturally scented and coloured and they are paraben and SLS free. So if – like me – you’re a lover of hand-made soaps check them out! For more information go to www.bakewellsoap.co.uk. This entry was posted in Bath and tagged Calendual, Calendula petal, elasticity, hand made, May Chang, paraben free, The Bakewell Soap Co. Bookmark the permalink.